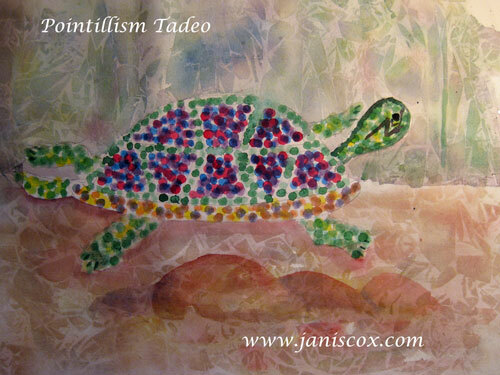 Crafting Saturdays - Pointillism Tadeo Turtle. I thought I would try something new for me. 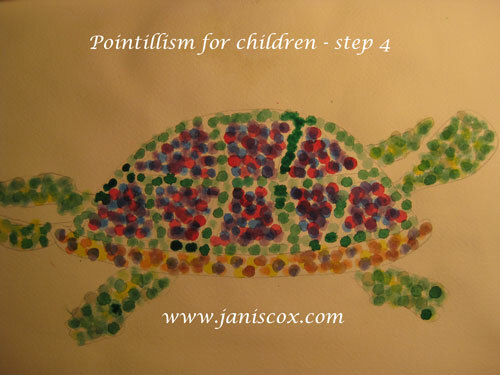 I decided to paint my turtle using 3 colours and Q-tips. I used blue, red and yellow. I used the technique called Pointillism. 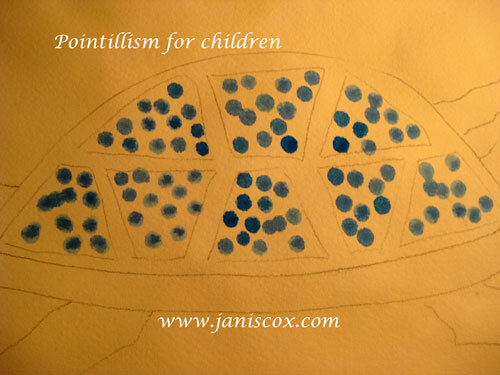 I waited while each colour dried before applying the next set of dots. I did not try to be exact the way the masters were. I tried to do as a child. I had fun. 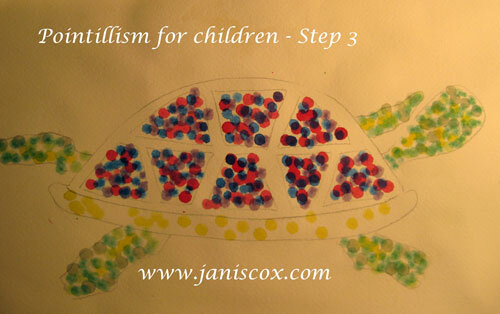 After drawing an outline of my turtle, I started with the first colour dabbing dots into the turtle’s shell. 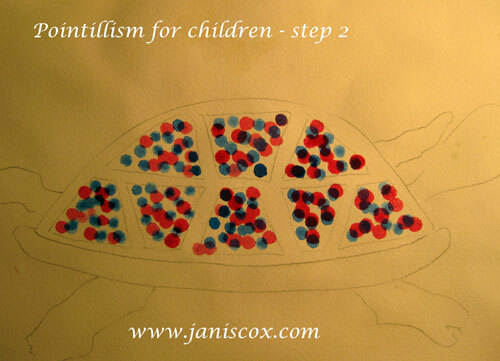 I continued to add colours to the shell. Then I added dots of colour to the head, feet and tail. When I had finished I dabbed in any areas that seemed to need more colour. 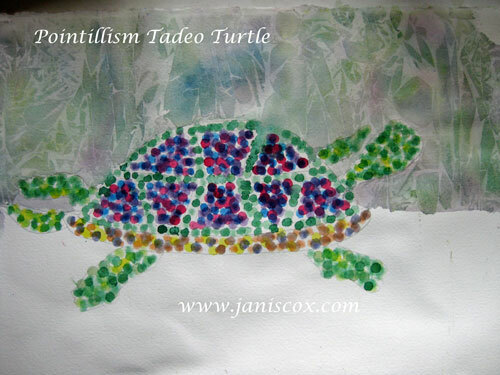 At this point you could cut out the Tadeo Turtle or make a background using the dots. I decided to use the plastic wrap background. For the background I wet the paper; then I dropped paint into the wet paper; I applied plastic wrap in long strips to look like bushes and leaves. For the foreground I wet the paper again; then dropped a mixture of all the colours to make a brown and a grey; I added other colours as well. 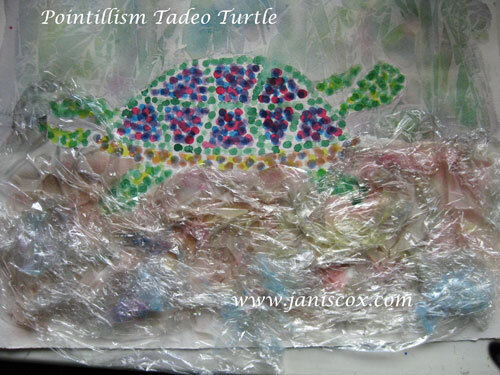 This time with the plastic wrap I placed the plastic to look like stones and rocks. Here is a picture with the plastic covering the foreground. I placed heavy books on the plastic and WAITED. That is always the hardest part. This is my picture after removing the plastic wrap. Here is the final picture when I added a little bit of shading, a couple of rocks and a face on Tadeo. 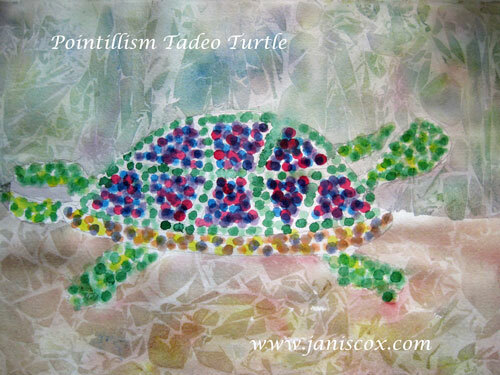 This entry was posted in Watercolour and tagged art, Crafting Saturdays, Crafts, Janis Cox, Pointillism, watercolour on May 4, 2013 by JanisCox. Visiting from the Mommy Monday. I’d love for you to share your family-friendly crafts and ideas at Monday Kid Corner at thejennyevolution.com. See you at the party! Thank you for visiting. Yes I shared our craft for this week. Thank you so much. For some reason your comment ended up in the spam folder. Janis, nice to meet you and thank you for your comment. nice pointillism here too. So, I think you may have been confused that the sing up was for you to link to the art related to the theme –monogram in this case, which I gave out two weeks ago. So, watch out for the next theme announced tonight adn sign up when done , linking to your art. Fun! I might have to try this with my girlies! As always, this is amazing.This is such a great post. I would like to invite you to link up this post to my Money Saving Monday Link Up so others can find this great idea. Please stop by and link up. This is just beautiful and perfect for my boys! Thank you for providing this resource. I am eager to see more of what you have done!